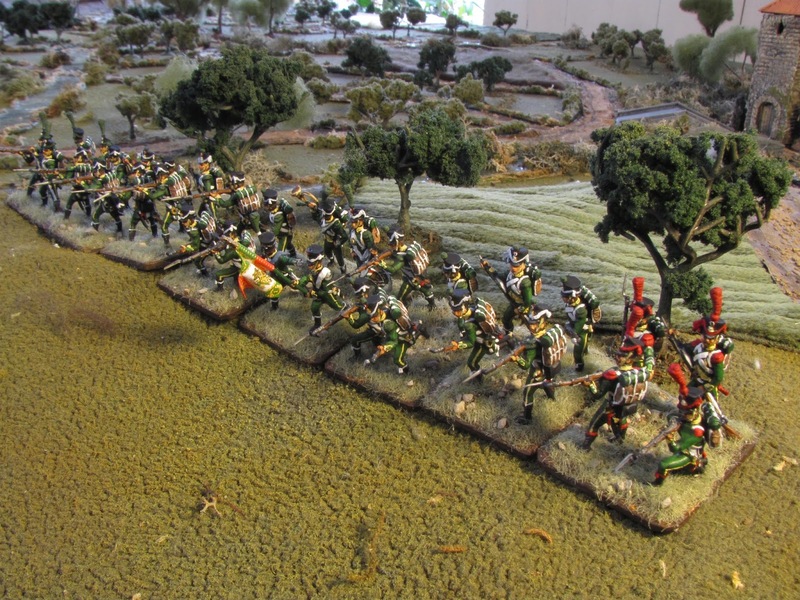 Among the many nationalities that fought under the French flag during the Peninsular War were the Italians. They were recruited form the Kingdom of Italy, a French client state in northern Italy and under the direct rule of Napoleon himself who served as their king. In the course of its existence it provided Napoleon with over 200,000 soldiers and fought in all of Napoleon's campaigns. In Spain the Italians were part of St. Cyr's 7th Corps that battled the elusive Spanish in Catlan, and later continued under Suchet at Tarragona and Saguntum. 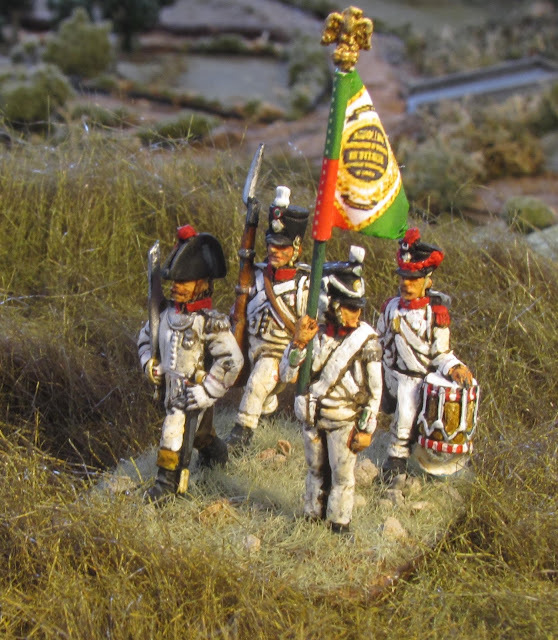 I painted up these two regiments to serve in the Battle of Valls, a Peninsular War scenario that I'm in the process of finishing up. They will represent Pino's Italian Division under St. Cyr. Light infantry of the 1st and 2nd Italian Light Infantry regiments. 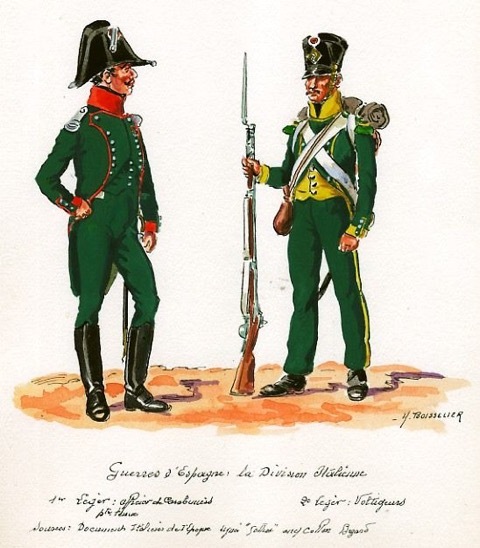 The Italian uniforms were essentially the same as the French of this period. 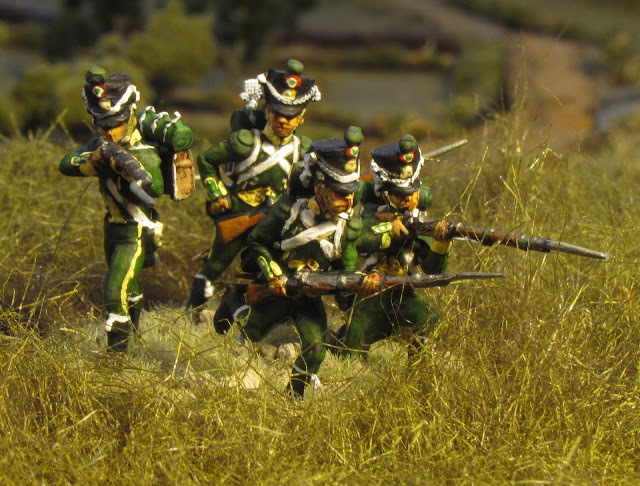 I based the light infantry miniatures on the 1st Italian Light Infantry Regiment, using Zvezda French voltigeur figures that I had hanging around. 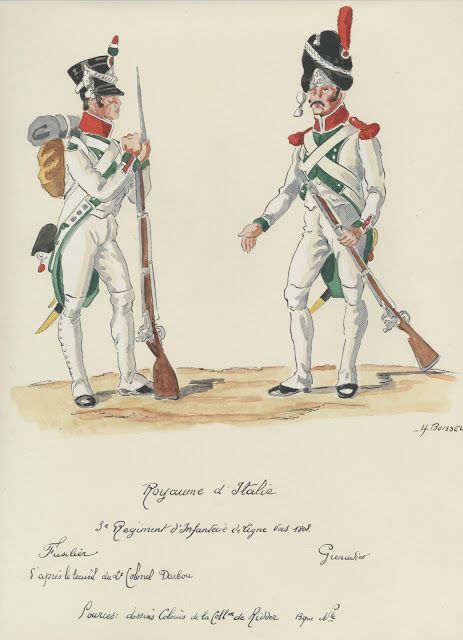 The only changes I made were to the flag bearer (originally a sergeant carrying a company pennant) and lopping off the taller plumes to help distinguish the chasseurs from the voltigeurs and carabiniers. Reference seems to indicate that the carabiniers probably wore the bearskins, but I'm sure that the shakos often replaced these as they did with other French regiments. 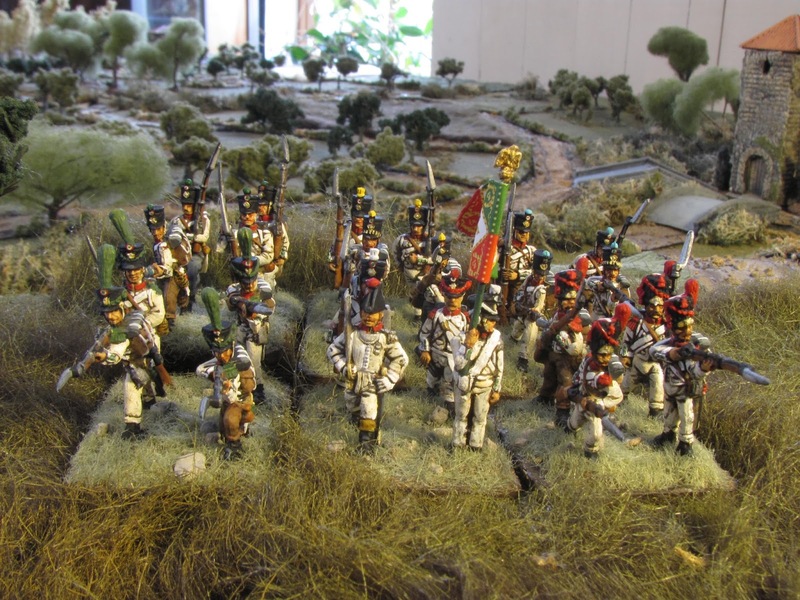 The yellow stripe up the breeches turns up in a number of paintings of these troops so I have included that as well. 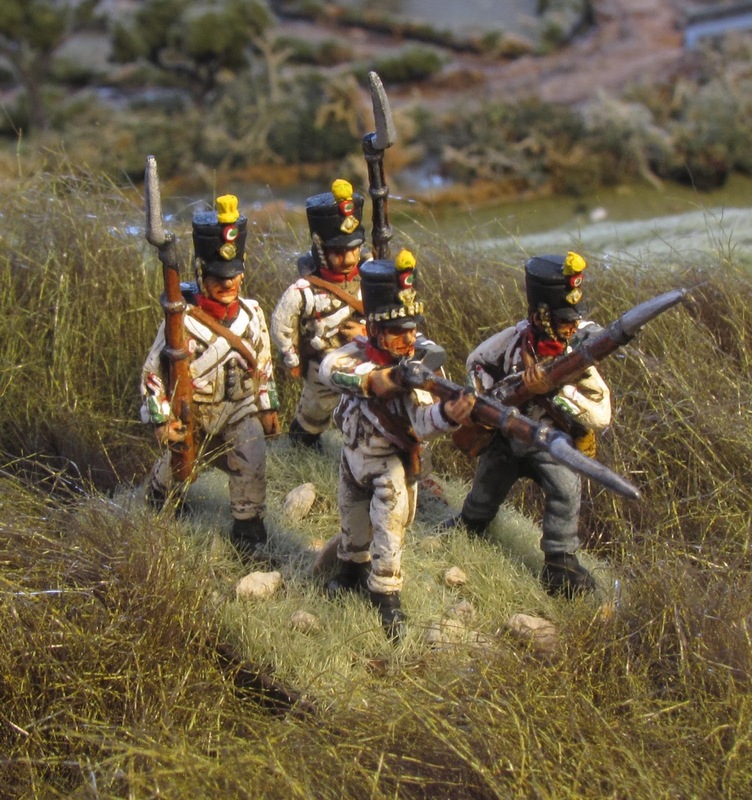 Once again the line infantry are from my ubiquitous Hat 1806 set, solid and easy to paint and representing the fourth Italian Line Infantry Regiment. 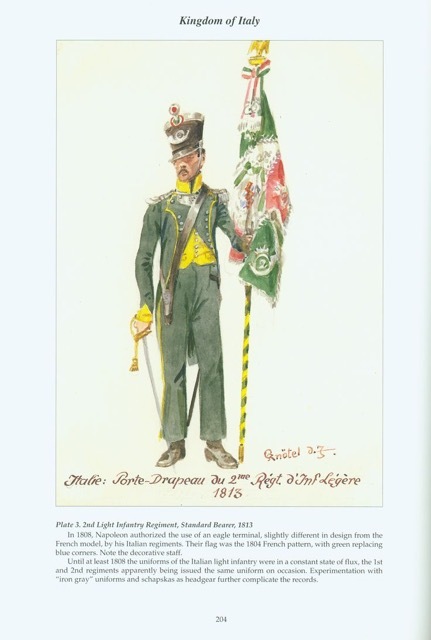 The only exception is the flag bearer who has been altered from a Hat 1806 light infantry command figure. My white on white painting continually evolves and I was pleased with the way these worked out. They are wearing the earlier uniform style and colour, as would have been seen in Spain in 1808. Light Infantry command stand. The flag bearer was created by remodelling the pennant bearing sergeant in this set. Line Infantry command stand. 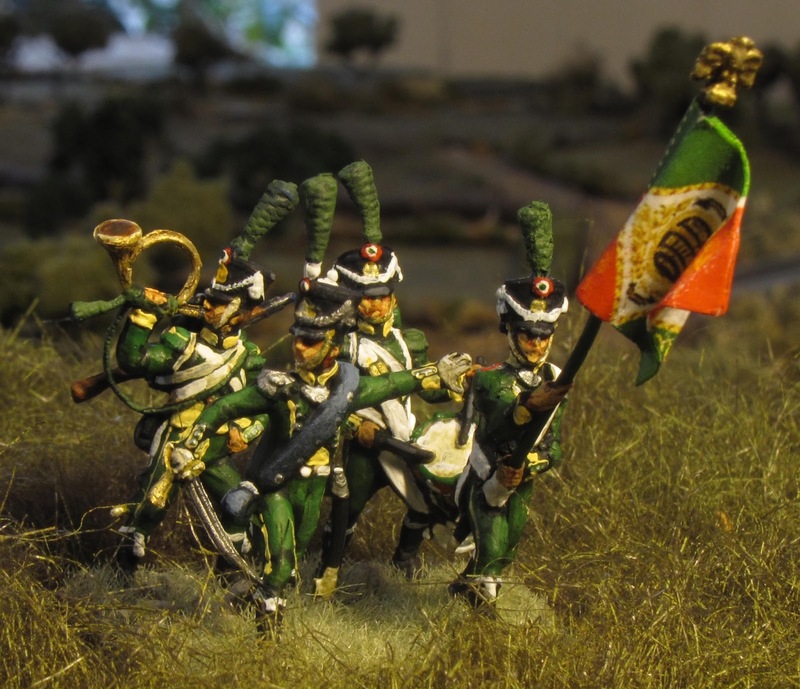 Flag bearer was a remodelled Hat light infantry figure. Some reference showed green piping on the 4th Line's jacket but I went with the histunif.com reference, that only had that piping on the later uniform and showed the earlier uniform simply with green cuff flaps. Hi Bill, another excellent post in your excellent blog! Nice painted minis, explanations of your choices, color plates and links to documentation, the work of a military historian! Thanks, Phil. So glad you enjoyed it! That was my very first amry, so many years ago! And these Italian troops are much more beautiful than mines, great job Bill! Thanks, Phil. That's an interesting choice for your first army! Very nice the Zvezda lights look good in green and the Hat line look great full of character. Thanks, Tony. Yes, those HaT French ARE full of character!